Did you ever wonder what your life would have been like if you’ve chosen Road B instead of Road A? In Life After Life, heroine Ursula Todd has the ability to live parts of her life over again, making adjustments to small decisions that have enormous consequences for her own life, for the lives of those she loves, and for history. It may be—as her psychiatrist tells her at age ten—that she’s experiencing a strange form of reincarnation. Perhaps she’s an “old soul.” Or does she have second sight, as Bridget the maid states matter-of-factly? Although she’s only aware of her gift—or her curse—intermittently and fleetingly, Ursula is not most people. And author Kate Atkinson doesn’t waste time explaining the metaphysics of the phenomenon; she’s intent on telling the story of Ursula’s life. Or lives. This is an incredibly imaginative historical novel spanning 1910 through 1967. Bracketed by the Great War and the Six Days War, the story twines around World War II as it’s endured in England (and alternately in Germany) by a variety of characters, with Ursula always at the center. Atkinson uses her remarkable storytelling skills to circle back and back and back again to significant periods in Ursula’s life, judiciously repeating, amending, and reinventing a lifetime of small details: dinners and dogs, delight and despair. I love that near the end of the book, we’re still uncovering specifics, not only about Ursula and her family—but even about beloved family dog Bosun. The artistry with which Atkinson shifts and shuffles the tiny— yet often, eventually—significant parts of the novel is impressive, especially across 529 pages. In one version of events, Ursula finds Teddy’s ball; in an alternate scene it’s still lost. The fox scurries away, or it’s shot. The photo of “Guy, lost at Arras” is on the side table, or it’s not. Other times, she’s blissfully unaware. I’ve written more than once this year about how some contemporary novels seem to be all cleverness at the expense of story. So let me emphasize that Life After Life is wonderful as story. Atkinson has woven her thought-provoking and enigmatic motif of alternate lives deep into the fabric of her narrative; it enables the telling of Ursula’s adventures. These patterns and layers make her tale richer and more poignant. At the heart of Atkinson’s success, I think, is her splendid ability to facilitate—first quickly and then intensely—the reader’s understanding of her characters: the ones you fall in love with, the ones you trust only a little, the ones you love to hate. This skill is gracefully evident in Life After Life. I quickly felt a part of Todd family gatherings, and frolicked in meadows and ducked bombs with Ursula. 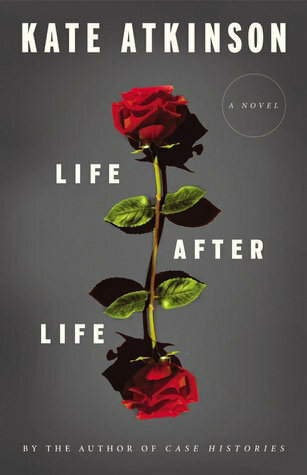 The year is not yet over, but as of this writing Life After Life is my favorite novel of 2013, and my favorite of all Atkinson’s books I’ve read so far. (I think I’ve missed one or two, and I’ve been singing the praises of Not The End of World for years). If only I could shift time a bit myself, and begin it both anew and yet again. This is a really popular book. It’s won the Guardian’s Not the Booker prize and I’ve read lots of blogs about it. I found it intriguing but difficult to warm to because the character of Ursula was rather indistinct – she changed a lot depending on the circumstances. Of course that’s the point of the story! We are a sum of what happens to us. Maybe I am uncomfortable with that. Maybe I need to be a more tolerant reader. I liked the way you picked up on the details I totally failed to spot! I feel that I’m often an intolerant reader, too. I’d read some less than positive things about Life After Life and was worried—being an Atkinson fan—that I’d dislike it. So I was delighted/relieved that this book grabbed me right from the start.